See and be seen, in the Imperial Hotel’s ‘Peacock Alley’. The storied Tokyo hotel was one of six buildings in Japan designed by Frank Lloyd Wright. 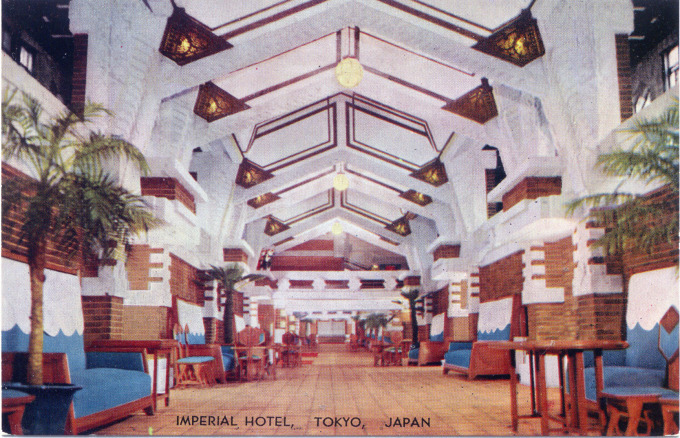 The Imperial Hotel famously survived the 1923 Great Kanto earthquake, shortly after opening for business in July; its experimental foundation principles were steadily improved upon, resulting in the forests of earthquake-resistant skyscrapers seen throughout Tokyo, today. The 1923-1968 iteration of the Imperial Hotel (there have been three) was well-worn and threadbare by the time of its demise. It was said its suite hallways had taken on wavy, twisted appearances as the structure became settled and shifted against the reclaimed ground upon which it was built. Maybe more important, the hotel lacked certain amenities, too, including air-conditioning, which appealed to post-war travelers.